The true story of Nick Battle, former bass guitarist with 80s Christian rock band After the Fire, who became a music industry mogul. He was involved in introducing the Spice Girls to their music publisher. ^Personal tragedy and triumph are never far from Nick's life as he journeys through life trying to balance his faith with the self-obsessed industry in which he works. ^^^Following great success working with such famous names as the Spice Girls, Cliff Richard, Talking Heads, Clannad and Take That, Nick's life suddenly changes dramatically when a family crisis changes everything. ^^^Discover how Nick has to give up a six-figure salary but in the process experiences God's love in a new and living way and learn lessons of how to trust God completely when everything else seems to be going wrong. - Publisher From humble beginnings, Nick Battle seemed to have it all. A successful career in the music business had brought rich rewards, working alongside such famous names as the Spice Girls, Michael Ball, Clannad and Simon Cowell. Being married with two wonderful daughters had kept Nick pretty grounded, despite some of the temptations of show business. However a traumatic family illness leaves Nick devastated. Can he cling to any sense of meaning in life when his whole world starts falling apart? 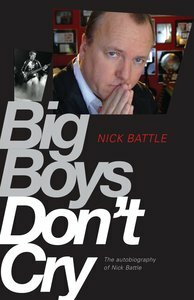 About "Big Boys Don't Cry"
From humble beginnings, Nick Battle seemed to have it all. A successful career in the music business had brought rich rewards, working alongside such famous names as the Spice Girls, Michael Ball, Clannad and Simon Cowell. Being married with two wonderful daughters had kept Nick pretty grounded, despite some of the temptations of show business. However a traumatic family illness leaves Nick devastated. Can he cling to any sense of meaning in life when his whole world starts falling apart? Nick Battle worked in the music industry for thirty-one years. He is the founder and director of the Gravel Road Trust, a charity which supports families who have suffered loss, and is the author of The Daily Male and Big Boys Don't Cry.